She’s had an incredible week partying and exploring in a tropical paradise. So it’s no wonder Tully Smyth tried to capture the moment as she left Fiji with her friend and fellow former Big Brother comrade, Jade Albany last Sunday. Standing close to her friend with a stunning backdrop of clear water behind them, Tully pursed her lips together as she posed in reflective sunglasses and a dark bikini top. “After spending a week straight with this weirdo, I kinda miss having her around,” she captioned the shot. She also took the opportunity for one last look out at the view, standing on a jetty dressed in a crop top and denim shorts. In another shot she poses solo, wearing a white Ksubi shift dress with a palm tree printed at the bottom of it, with black sandals and a brown fedora. She didn’t stop there though, uploading another snap of herself, this time in a very colourful patterned Alice McCall romper with blue mirror sunglasses and a flower behind her ear. Since landing in the tropical paradise last Sunday, Tully and Jade have treated social media followers to bikini snap after bikini snap from the picturesque shores of Fiji’s islands. The girls posted photos showing them taking their coconuts and tasty refreshments out onto a sandbank, the pair and some of their new pals danced about in ankle-deep water wearing playful bikinis. In another, Tully left the group to pose solo with a stunning Fijian backdrop. Raising her hands above her head, the social media wiz kicked out her right hip to show off her trim, taut and terrific bikini body. Donning a pair of reflective blue shades, the eyewear matched her bold bikini with sheer, black halter to perfection. The sun safe model also threw on a wide-brim black hat for added protection. It hasn’t all been bikinis and sun-baking for the blonde babes. 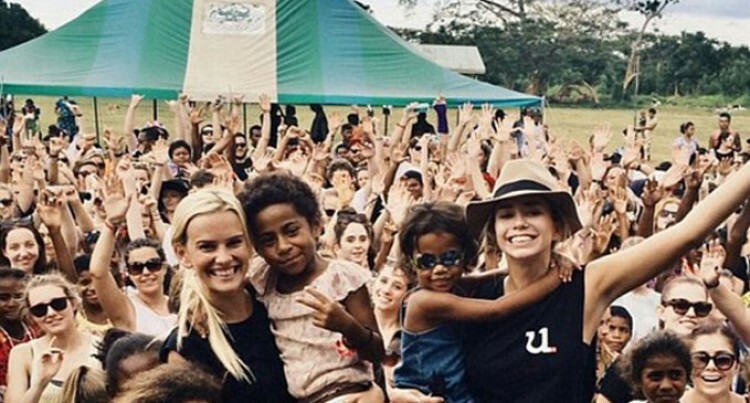 On Wednesday, Tully shared with Instagram followers the overwhelming emotion she felt when she visited a Fijian school and helped deliver $100,000 of sports equipment. They were so warmly greeted by children at the gates of a school on Nadi Island that she and fellow BB star Jade Albany danced on the spot with the obliging youngsters.